When the sun is shining you have a choice to make – do you let the light in, or do you keep it out? Whichever decision you make, JYSK has a wide selection of curtains and blinds that do the job, look great, and don’t cost the earth. 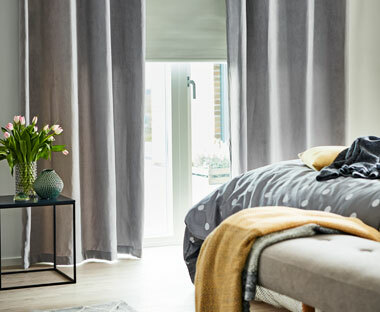 Whether you have a preference for simple, straight curtains or you think that pleated curtains would suit your room better, we have a great variety to choose from in a wide array of colours and lengths. 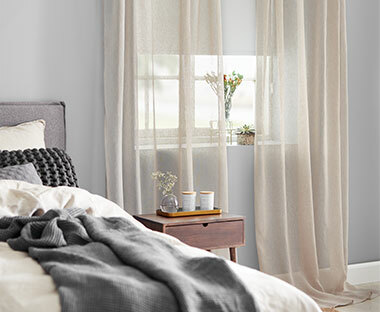 If you like to make your curtains, you will be able to purchase rails and fabrics, and if you want to make sure that everything is spot on, you can even take a swatch home with you before you buy. 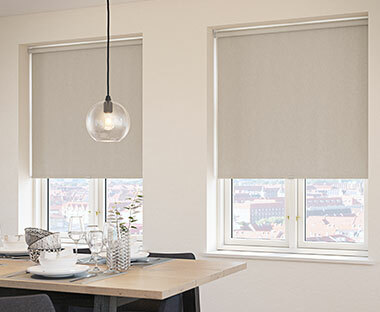 If you like the ease of being able to hang something the minute you get home, then our selection of blinds will suit your needs. We have roller, Venetian and bamboo blinds available for you to buy. Choose from a variety of colours and materials, as well as blackout blinds to help you get a better nights sleep. Curtains can add an extra level of comfort to your home as well as being very practical for privacy and to keep the sunlight out. Choose from a range of ready-made curtains as well as net, viole and blackout curtains. You can also add great quality children's curtains for your child's bedroom at reasonable prices.